Welcome to the 28th Table Top Tuesday. With so many of us thinking and hoping for fall to get here in a hurry and all the very hot weather to be gone, I am sure there will be tons of inspiration with all of your new table tops. I can hardly wait. I am so ready to bring in a little fall. Some small subtle changes have started in the living room. A small ivy in an italian pottery pitcher and hurricane replace the vase of sunflowers. Everything else was there already. I found a pair of these hurricanes at the GW. Love the large size. I filled the bottom with a few coffee beans, then just added some fall leaves around the candle. A little burlap ribbon tied around the base and it was done. Nice change of pace. Remember hurricanes work for the Fall Cloche Party on Sept. 17th. Click the button on my sidebar for details. On this side table I replaced all the white birds with a plant and 3 candlesticks. 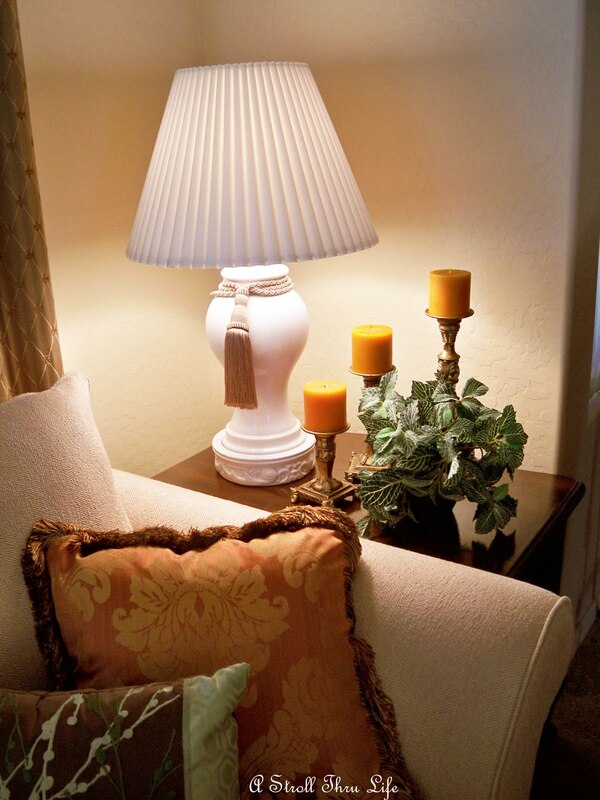 The orange candles add a little warmth to this corner. A candle in a hurricane, stacked on a couple of books replaced a plate that was on a stand. That's all that was needed to change this table. Sorry the sun is such a glare, but at least it has cooled off just a little. Be sure to link up below. I look at everyone and I am always inspired. I love you fall changes with the candles, leaves and pops of orange. I am really into orange this year. I had problems getting pics this morning because of the glaring AZ sun in the windows too! But it is sort of looks like fall with the cloudy skies and slight breeze. Marty your home is beautiful and ready for the change of season. Your new pillows are gorgeous. I don't know how you come up with so many new ideas Marty! I love your autumn vignettes and those pillows on your sofa are just gorgeous! Your living room really is stunning! Looks great Marty! Lovin' the warm colors, leaves and burlap! Hi,thanks for your comments im my blog,I like too much them.You said that I'm organized, but you also are, and your home is perfect in the details. The vignettes fall is WONDERFUL!Everything is perfect,is like a photo of a decorating magazine. Great! Beautiful...absolutely BEAUTIFUL, Marty!!! You are sooo right about how different a room can look by just changing out a few of the accessories! Of course, I first learned this from you, my friend! I love all of your autumn pretties...it IS beginning to look like autumn...even though it may not feel like it yet! Hehe! It's still very hot here in Colorado as well. I love your large hurricanes...you always do such pretty things with them! I love the simplicity of the autumn colored candle...sitting atop the coffee beans and fall leaves...and that pretty little burlap ribbon! I love, love, LOVE the burlap ribbon...such a simple thing and yet it just sings "Autumn"!!! Well sweet friend, thank you so much for sharing your beautiful home and a few of your seasonal changes...I loved it! I have just begun at my place. I changed out the white and green dishes in my china hutch to all my red dishes! Maybe I'll get photos for next week! 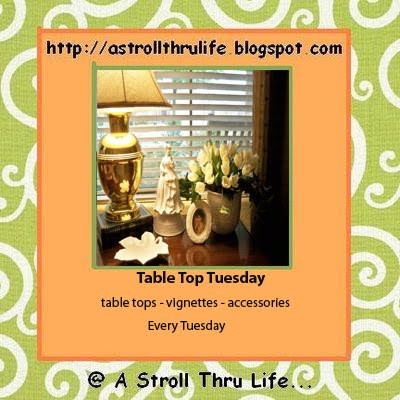 Thank you for hosting Table Top Tuesday...I always have so much fun at this party!!! 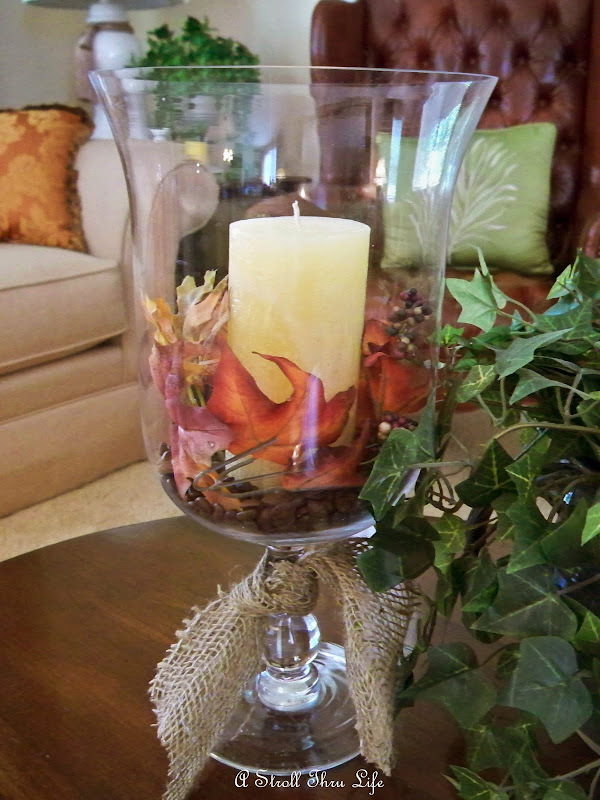 I LOVE the fall foliage in the hurricane candle holders!!!! FAB idea! Marty, all your changes look so good. I am so ready to decorate for fall, too. I am just loving the oranges and greens in your home. I love the coffee beans in the hurricane, the aroma is so warm and inviting! 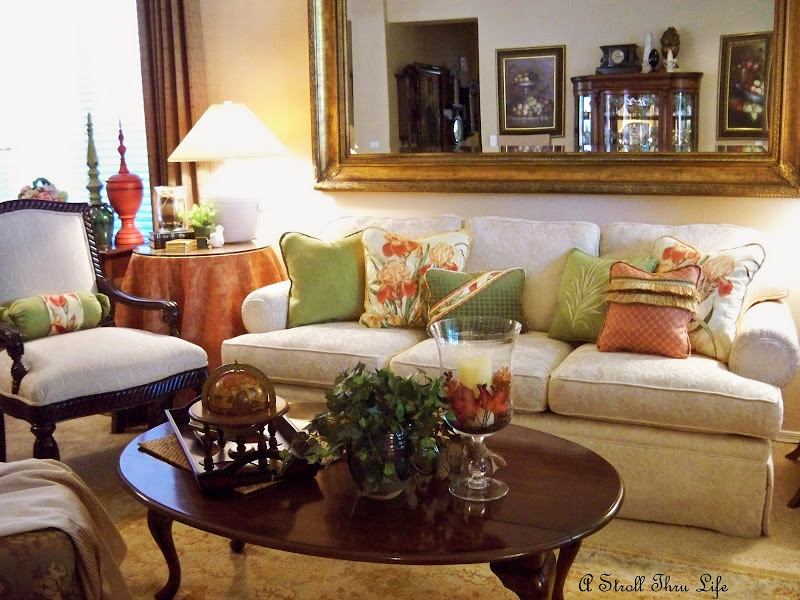 The pillows on the "new" cream colored sofa in your living room makes a dramatic statement. Keep these lovely post coming. .. always so inspiring! Oh how I love the colors of autumn. 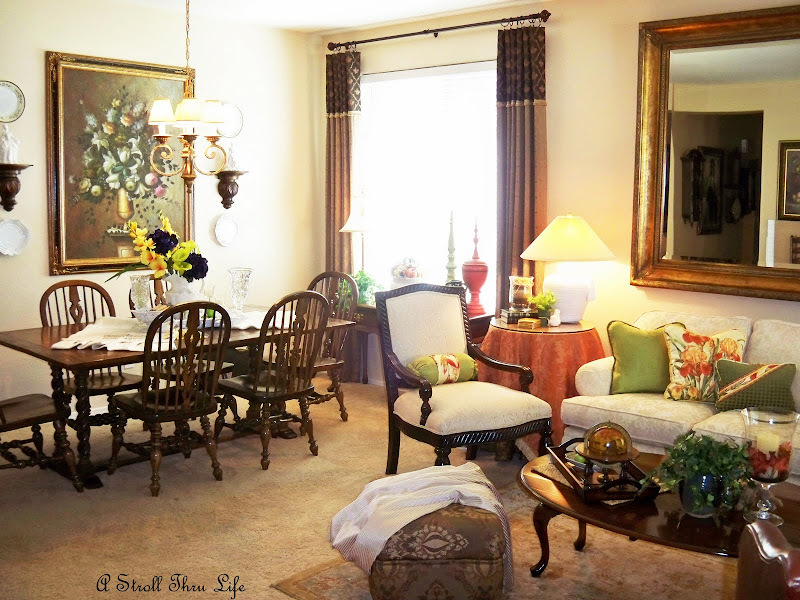 You've made such pretty quick changes to your vignettes. Your new changes look lovely. Wow, you do like to change things often, don't you? :)) Everything you do turns out so pretty. Beautiful table decor!! I love your orange candles..!!! Your Fall decor is so pretty! I need to get some of mine out, but I feel like I just put it away. I love the way you have brought fall into your room! I just love the hurricane with the coffee beans. Your living room is so calm and welcoming! I can't wait for fall! Oh I just love it all Marty, those colors are divine....I love the little touch of burlap on the candle. Thanks for hosting again. You did such a nice job of adding a few touches here and there! Everything looks so pretty! Love your subtle changes, just enough! It's still so hot here in FL I'm not thinking fall yet. I'm joining in this time, thanks for hosting! Gee, that's such a pretty room. And so neat and clean and tidy. It would be a pleasure to sit there and enjoy a visit with you. Can't believe fall is just around the corner! Beautiful Marty! So simple and so perfect! 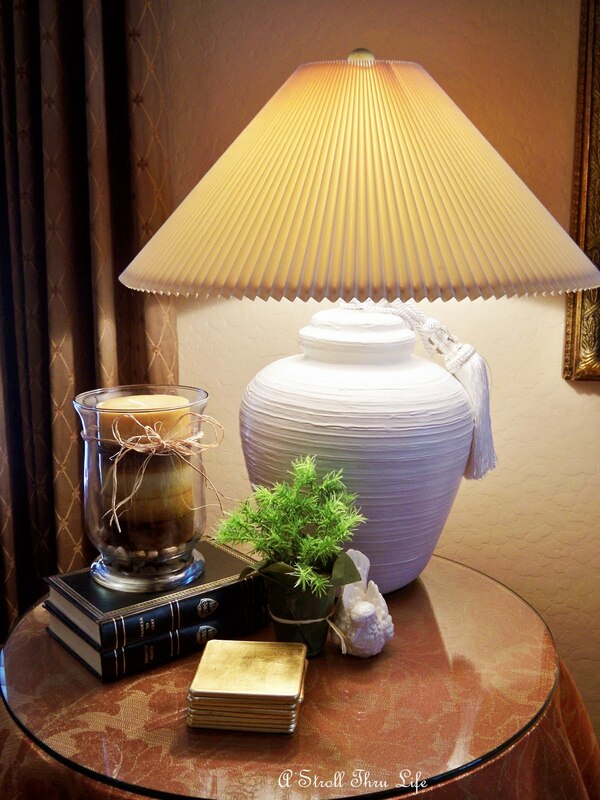 Love your hurricane lamp w/burlap ribbon. I have some fabric that looks like that but is not burlap left over from a Halloween costume I made years ago. I know what to do with it now...make ribbon..yippee! Oops! I meant to say I love the coffee beans in the hurricane too! I bet that smells wonderful! Great idea! Perfect little warm Autumn touches! I am so looking forward to the cooler weather! Marty, Beautiful job, just enough of a hint of fall without being to much. Love the pillows, you did a great job on them. Thanks for hosting and sharing. I'm trying to convince myself, but I'm not ready for fall. So cozy!! I could sit, chat, and be delighted looking at all your pretties. Aww, fallness at Marty's house! I love all of your cool changes, Marty! Just beautiful! Thank you again for being our most wonderful hostess!! Absolutely gorgeous rooms. I love your pillows. I am working on updating mine and you have some very good ideas. Thanks. This is wonderful Marty, I LOVE the idea of the coffee beans in the hurricane lamp, it must SMELL really great too... I LOVE FALL, it IS my favorite time of year... What is the temps now over your way? Your sofa pillows are so pretty and the orange and green finials off to the left pick up the color of the pillows so well! I always look forward to seeing what new spin you will put on your table tops each week. Now that fall is here I am hoping to start redecorating and getting some new table tops ready. 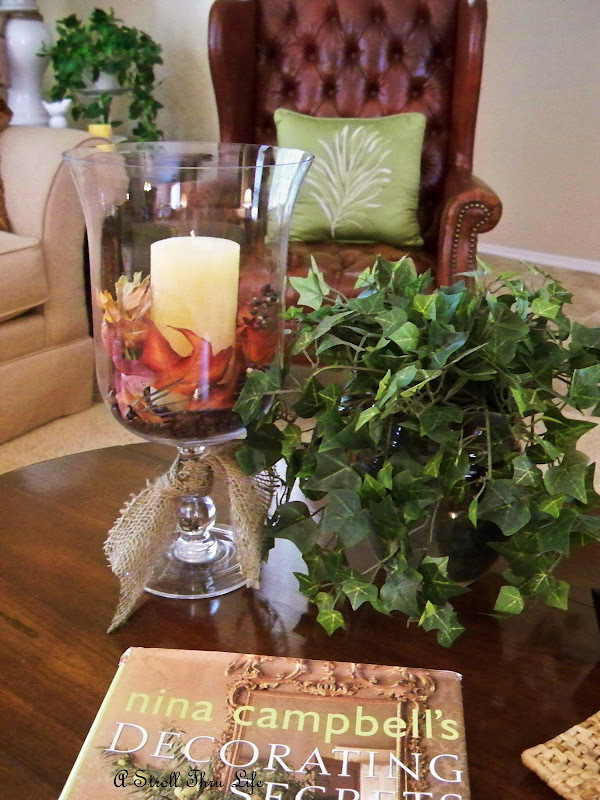 Your touches of fall are just lovely, it's wonderful and so much fun to add fresh new touches! Your home is just beautiful! Not only is everything autumnal and beautiful, I know that it smells heavenly with the coffee beans! I really love your orange and green accents, Marty! That orange is going to just take center stage once Fall officially arrives! I was drooling over all the hurricanes and the different sizes at the PB Outlet when I went a couple of weeks ago. I wish I could have picked up several, but I know prices are probably better at GW. You just proved that you do not have to fill every surface with fall decor to make a beautiful room.Love the hurricanes. Marty, I love the Fall changes you have made. The leaves in the candle holder is a great idea. Enjoyed this post. Marty, you create such wonderful vignettes, so quickly. You make it look easy! Lovely as always. Marty, you have outdone yourself! 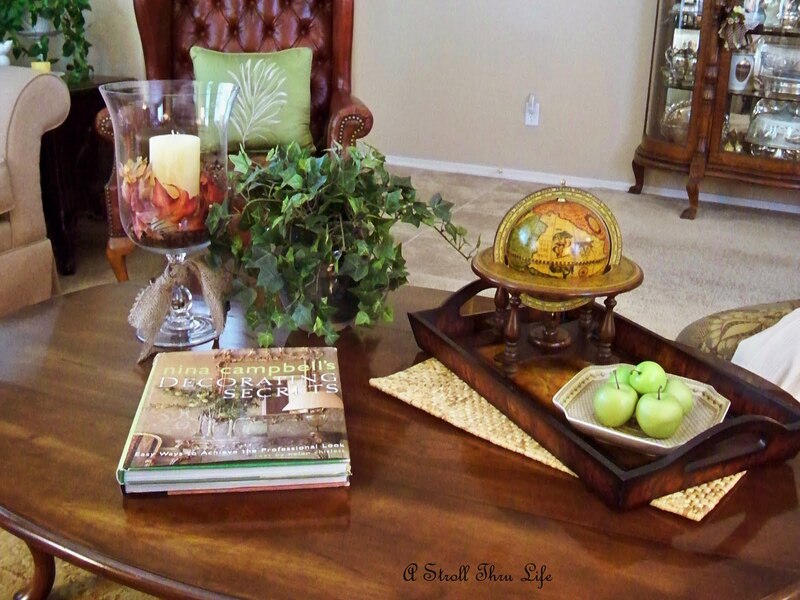 Your coffee table especially is so peaceful and simple. One of these days, maybe you'll rub off on me. Oh Marty, It never ceases to amaze me what joy I get when visiting you! I always love your ideas and wish I had so many of the same items to decorate with but I'll make do. Have a wonderful week dear friend. I love your home and the way you have brought fall into it. Coffee beans, brilliant! Your colors are awesome. I love the idea of moving things around every few weeks, will you come over to my house and do that? ;)) Your are inspiring, thank you! I never really changed out my things for each season. I just added a few things for each holiday. I would put a few things away to make room for Christmas decorations, but that was it. Then along comes blogging. I'm looking around at all my stuff and thinking maybe I'll tweek it a bit this year! You really show how much it changes a look to change just a few items. Love your new fall changes! I always have such trouble with table scapes and shelf scapes. Marty, love love love!!! It's perfection, really! 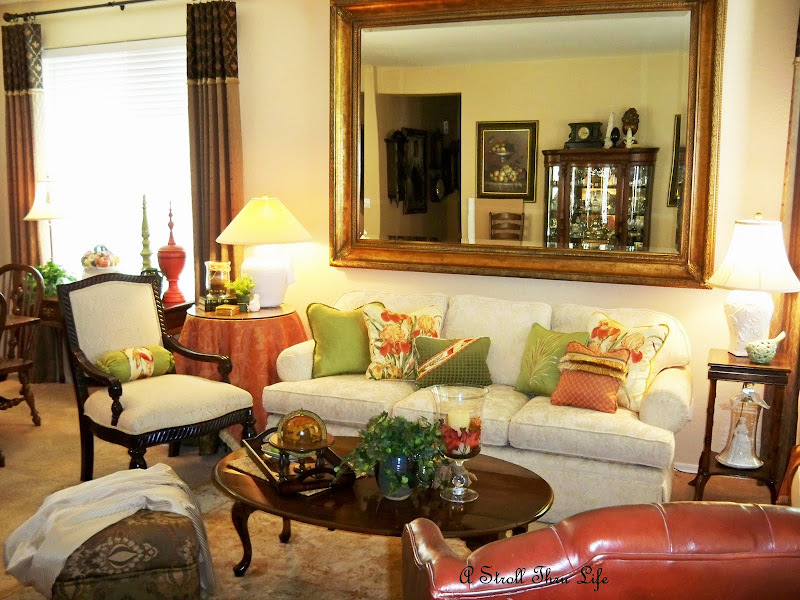 Love that super huge mirror over the sofa, too! So jealous. I wish I had wall space. :) Thanks for sharing, and for putting together such a great meme. :) I'll participate one day when I can get my schedule together!